Faces of young girls presenting Purim costumes have been blurred in ads published in Beit Shemesh's ultra-Orthodox newspapers, leading to a consumer boycott against the toy store chain marketing the costumes. The chain, Red Pirate, claims the ads were censored by the newspapers without its consent. The ad shows children "modeling" Purim costumes. But while the boys' faces are fully exposed, the girls' faces are blurred. The first to protest the incident was Hadassa Margolese, the mother of eight-year-old Naama who was humiliated by religious zealots on her way to school. Margolese posted pictures of the censored ads on the chain's Facebook page, stating: "Although I like your store here in Beit Shemesh, I will not shop in a place which agrees to blur little girls' faces in advertisements. I find it shocking." Many readers rushed to join the boycott, writing on the store's Facebook wall: "How disgusting… Do you also spit on little girls? That's the fashion now in Beit Shemesh"; "I am a woman with a face. Now I'll know not to buy from your store! "; "No one should enter your store, and not just in Beit Shemesh!" Following the protest, the Red Pirate chain issued a statement clarifying that the newspapers' editorial boards censored the girls' faces in the ad without consulting the chain. "The newspapers' kashrut supervisor made the decision to publish the blurred ad," the chain wrote. " As this is the first time we encounter such a thing, which happened shortly before the newspaper was printed, we were unprepared. Therefore, we will prepare accordingly for the next ads directed at the haredi sector and put an end to this phenomenon. "The Beit Shemesh branch of Red Pirate Toys would like to apologize to anyone, a man or woman, boy or girl, who may have been offended in any way by the published ad." Haredi newspaper Hadash BeBeit Shemeh, which censored the ads, said in response: "This is not a case of women's exclusion or girls' exclusion. The ads were blurred by the advertising company, at our request, out of respect to our readers – both men and women – who want to receive a paper which matches their worldview and lifestyle. "The attempts made by people who are not part of the haredi public to meddle in the desires of a different public are pathetic and doomed to fail, as haredi readers will not bring an unclear newspaper into their home. "We would like to note that the paper, which is handed out for free, includes a unique supplement for women written by haredi women, so the population of women receives the respect it deserves." 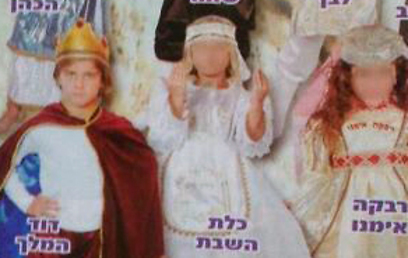 See all talkbacks "Haredi press blurs little girls' faces"